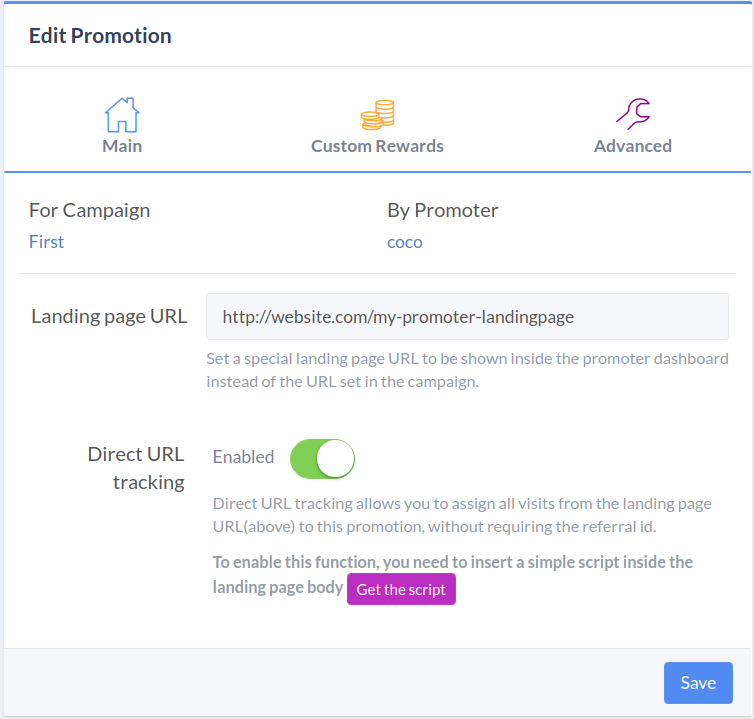 Click on the menu link(3 horizontal bars on last column) and select "Edit promotion"
Go to "Advanced" tab, enter the landing page url that you want to assign to that promoter and enable "Direct url tracking"
Click on the purple "Get script" button and copy-paste the script given to your landing page, just before the </head> tag. Note: This assumes the visitor tracking script(that loads fprom.js) is also added on the landing page. Important: If you enable direct url tracking and the direct url tracking script is added on the landing page, adding "?fp_ref=referral_id" to the landing page url won't track anymore, you'll have to use only the url you pasted on "Landing page url" field, without the referral id. To make sure the tracking works, open the landing page url on an incognito window and check if the clicks count increases.